MacKenzie Beach is a very popular sandy beach destination located south of the community of Tofino, BC on Vancouver Island, British Columbia, Canada. 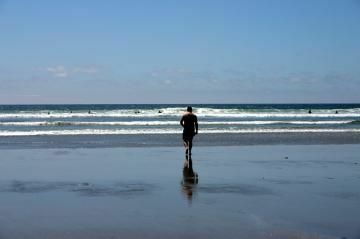 The beach is easily accessible, close to the village and butts up next to the Pacific Rim National Park beaches. Once at the MacKenzie Beach parking lot there is a a short dirt path leading out to the large sandy beach. The beach is home to a campground and vatious resorts. Because of the proximity to the resorts the beach welcomes larger crowds. 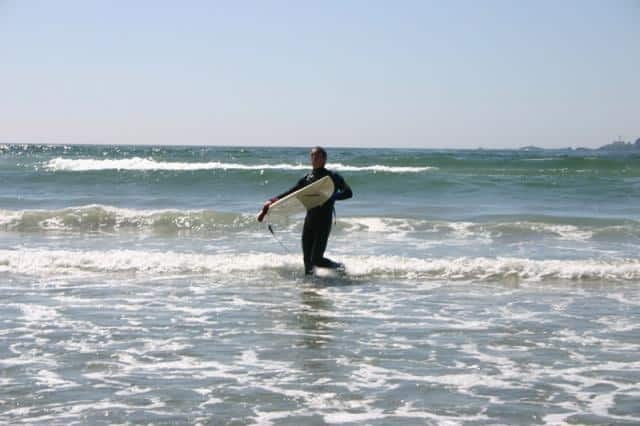 During Tofino, BC summers the activities enjoyed include surfing, beach-combing, boccie ball, frisbee, picnicking, sightseeing and swimming. In the winter, when the storms pick up, the beach is a popular destination for storm watching. MacKenzie Beach tends to get less winds and storm waves as it is protected by a family of rock outcroppings. The island rock formations create calmer waves therefore it is one of the more popular beaches for families. Dwarfed trees line the back of the beach. These trees are battered by the storms regularly therefore are bent over, leaning inland and do not grow as large. Lining the shore between the dwarfed trees and sandy beach is a row of driftwood logs piled high. The logs were put there by big storms as well. How to Get Here: Travel to the community of Tofino on the west coast of Vancouver Island, BC, Canada. Before entering the community look for Helesen Rd on your left towards the ocean. There is very little parking available. There is a large campground nearby.